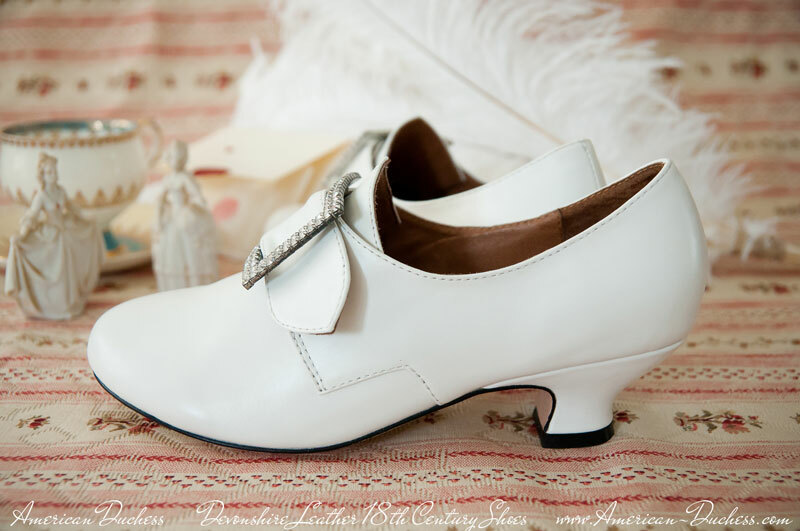 We have been eagerly awaiting the pre-order for the American Duchess Devonshire shoes. We really lusted after the Georgianas, but satin and the frequently wet Seattle didn’t seem like a good match. Most of our events are out-of-doors, so we waited. And now it’s time! The Devonshires are a leather 18th century shoe based on museum examples from the 1760s through 1780s. They’re made of top-grade dyable leather, with a beautiful, smooth Italian leather sole for dancing, and are hard-wearing, water- and mud-proof, for even the toughest of outdoor re-enactments. Pre-Order the Devonshires through August 10, and get the special $100 price. We’re only making 200 of these shoes, so don’t miss the chance to own one of only a couple hundred pair on the planet! Visit www.american-duchess.com to order. So if you need (or simply lust after) some pretty shoes for re-enactment, be sure to check them out.